The other night, Mick and I were able to sit down with Steve Von Till, singer and guitarist for music legends Neurosis. 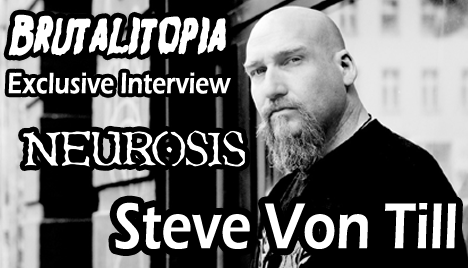 It's been a few days, but I still can't fully comprehend that this interview actually happened; Neurosis needs no introduction around these parts, and for my money they are the most influential band in heavy music over the past 30 years they've been a band. We spoke with Steve about the band's longevity, how they manage to continually produce consistently excellent material, and some changes he would make to elementary curriculum if given the chance. Check it out below, and be sure to catch Neurosis on their current US Tour, their first major tour in the country since the turn of the century. Actually, speaking of the tour, this was my first time seeing Neurosis live, and it lived up to every expectation I had. Scratch that: Neurosis blew my expectations out of the water, putting on a Hall of Fame-level show that had myself and the other people in attendance enthralled. For an hour and a half, they churned through tracks spanning their discography, and from the opening fuzz of "A Sun that Never Sets" through the pounding drums of "Through Silver in Blood," Neurosis performed at a stupefying, impossibly unsustainable level... and yet they did. To see Neurosis live is to see legends at work, to witness gods among men, crafting an experience that takes everything great about their recordings and dialing it up tenfold. It's been thirty amazing years, and while I wouldn't put it past them, thirty more may be a stretch. You WILL regret missing out if you don't see them.